Since the recipe calls for leftover chicken or turkey as well as the usual Thanksgiving supplies of celery, carrots, onion and stock, consider adding this to your turkey day leftovers lineup. Do you have a picky eater with texture issues? How do you work around that? Leave a comment: The Ninj wants to know. Melt the oil and butter in a large pan. Add the onion, carrot and celery and cook over medium to low heat until tender (about 10 minutes). Stir in the flour until the veg is coated, then add the stock. Simmer until thickened (just a minute or two) and add the half and half (or milk). Return to a simmer and add the chicken (or turkey) and herbs. 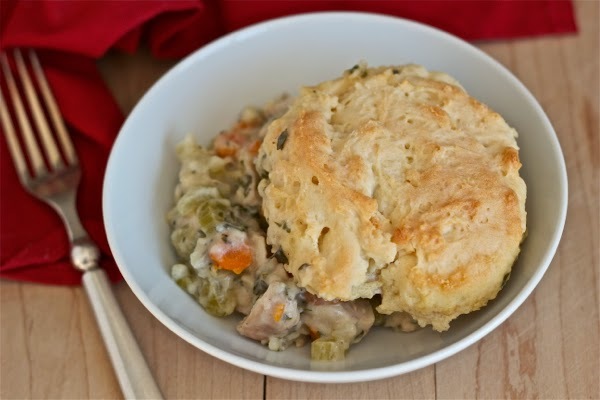 Cook a minute or two then pour the mixture into a prepared 2-quart casserole dish. In a food processor, combine the flour, butter, baking powder and salt. Pulse until the mixture is combined and butter is well-distributed. Add the milk and pulse again until the mixtures comes together into a sticky dough. Drop the dough into six large mounds on top of the chicken filling (the mounds won't completely cover all the filling). 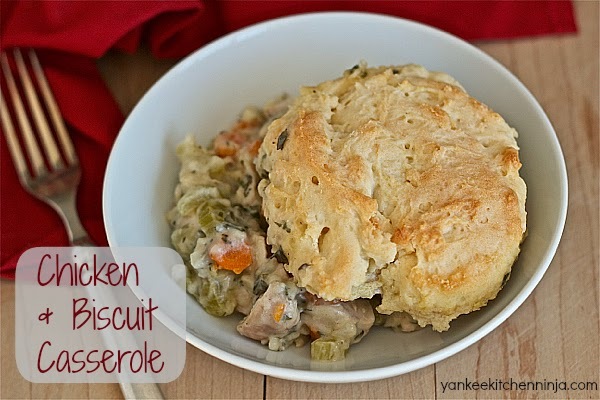 Bake for 25 minutes or until the biscuits are beginning to brown and the chicken mixture is bubbly. This is my idea of comfort food too!